Description: this four legged creature doesn’t look much unlike modern day monitor lizards or iguanas, except for the large “sail” on its back. Dimetrodon, the name incorrectly spelled as 'Dimetradon' on its package, also features two pairs of tiny legs (almost dragging its belly over the floor), a “segmented” tail and a big boxy head. It comes with a biting action feature: pushing its left hind leg back makes the jaws open wide, while releasing them makes them close with a powerful snap. The figure measures some 15 centimetres in length and 8 centimetres in height. It stands in a walking posture, with its left hind leg and right front leg posed backward and the other legs posed in a forward move. It's a rather green figure. Almost all of the body is posed in a swampy green colour, including the legs (and claws) and the head, while the neck, back and upper part of the tail sport a darker tone of green instead. On the head, around the eyes and snout, a line of this same dark green is found in a largely symmetrical fashion. The sail is painted beige, with various light green stripes and shapes on both sides. The creature has small black eyes, a pink tongue and white teeth, as well as a black JP logo on the right side of the base of the tail. The figure also comes with two pieces of capture gear, a small chain to restrain the limbs (though only two of them at the same time, not all four), as well as a large muzzle to keep the creature from biting. Both pieces sport a shiny metallic, light brown (almost gold) paint job. Analysis: it took a while, but the classic Dimetrodon figure from JP Series 1 finally got a repaint for the first JP: Dinosaurs line. The paint job is actually not all that different, mostly green but in different hues, but the colouration of the sail is certainly something else, opting for a lighter, more relaxed paint scheme with stripes instead of spots. The figure could have used some more work, since its underside is rather dull (no painted claws for instance), but considering the sail and head are the most striking body parts such minor oversights can be forgiven. This time, Dimetrodon too is the victim of capture gear. It comes with two pieces, both of which originally came with the TLWS2 Ornithosuchus instead. Since they just happened to fit on this creature too it saved Hasbro the need to design new capture gear. The leg piece isn't as easy a fit for this animal as it was for its original owner, considering its legs are somewhat fatter, but it does the job well enough (though in this case too only restraining one pair of legs). 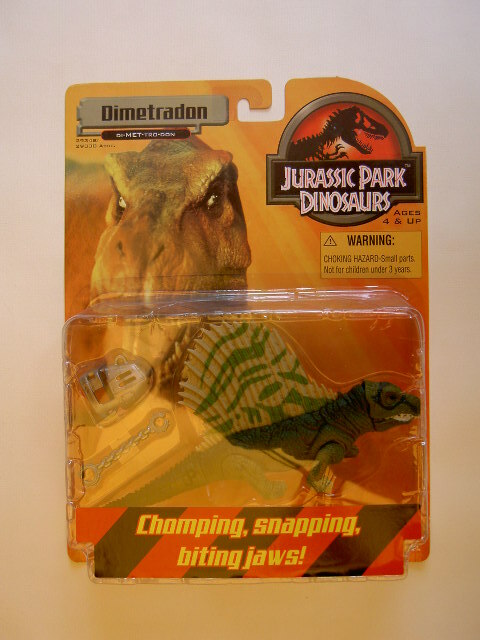 The muzzle is of more use though and easily puts a stop to Dimetrodon's nasty chomping habits. As for these, the sculpt's biting action has not been changed and is still a blast to perform, gnawing on poor human figures or other unfortunate creatures. As such, Dimetrodon remains a tough critter to reckon with and a welcome addition to this repaint line. Repaint: yes. This is a repaint of the original JPS1 Dimetrodon, with repainted capture gear from the TLWS2 Ornithosuchus. The figure would be repainted a third time for JP Dinosaurs 2. Overall rating: 7/10. The paint job is adequate, though nothing really special. Otherwise it's still a fine sculpt and a welcome change from actual dinosaur figures, being a Synapsid instead. As a part of the not very common second wave of the first JP: Dinosaurs line, it's not always an easy find, especially complete or MOC, so you might have to track it down to some extent if you feel you need one.